I absolutely love these beaches. 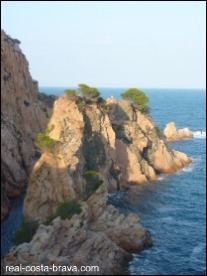 One of our favourite activities is walking the section of the Cami de Ronda that snakes around the Begur headland. Each corner you round brings another beautiful cove with an inviting beach. Interesting fact (well, maybe) - much of the 1959 film ‘Suddenly, Last Summer’ starring Elizabeth Taylor was filmed in Begur and Pals. 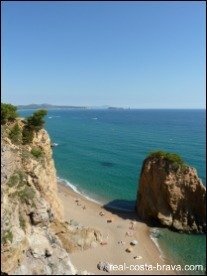 Platja del Raco is at the very southern end of the 5km stretch of sand that incorporates Pals beach and L’Estartit beach. 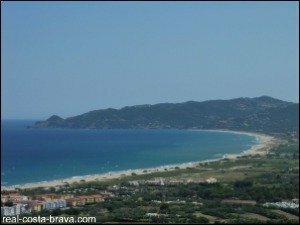 Lying on the wide sands of Platja del Raco affords cracking views of the Begur headland to your right, and L’Estartit backed by the Montgri Massif and fronted by the marine reserve of the Medes Islands to your left. 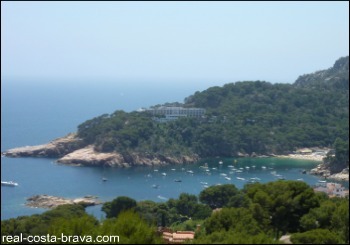 Illa Roja is a picture postcard perfect Costa Brava beach...plunging pine clad cliffs give way to a golden sand beach and the bluest of seas. A very long time ago it used to be two beaches, but the rugged headland that separated the two coves has since crumbled to the sea, leaving a towering reddish rock (that gives the beach its name) at the waters edge, which provides a welcome bit of shade on hot summer days. If you fancy being at one with nature...this is the beach for you...Illa Roja is a nudist beach (but feel free to keep your clothes on if you wish). 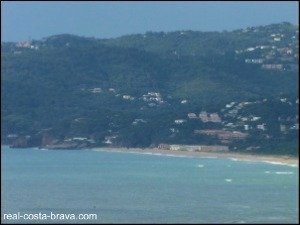 Sa Riera is one of the biggest beaches on the Begur headland. 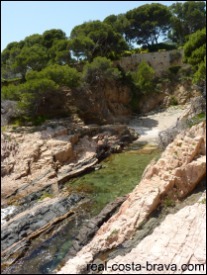 A river runs through the beach (which explains its name, riera means torrent). 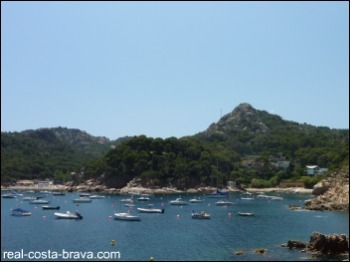 Behind the beach lies the town of Sa Riera. Sa Riera was awarded a Blue Flag in 2007, 2008 and 2009. It wasn’t awarded one in 2010, but we are unaware of the reasons for this. Want to read more about Sa Riera? The small cove of Aiguafreda doesn’t have a beach. Instead, a concrete platform (it’s more picturesque than it sounds) has been constructed to act as a pier for boats and to provide an area for sunbathing. Sa Tuna is a relatively small pebble beach in front a few taveranas (one of which is the fantastic Sa Tuna Hotel Restaurant) and some beautiful converted fishermen’s houses set in a deep cove with a backdrop of pine clad hills. Development has encroached on Sa Tuna over the last few years in the form of several apartment blocks, but fortunately, they are low rise and relatively attractive. Also you cannot see them from the beach or on the approach to the beach as you walk round the headland. 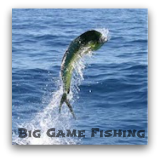 In fact you are only really aware of them if you drive to Sa Tuna. The good thing about the apartment blocks is that when they were constructed an underground car park was built for the village - it used to be a nightmare trying to park here in the summer! The rocky headland either end of the beach makes for great snorkelling. 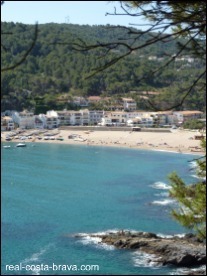 Platja Fonda stands out due its dark coloured sand (fish really stand out against dark sand when snorkelling!). The beach is backed by pine trees that grow right down the cliff face to the sand, giving the beach a really private, secluded feel. Although, there are plenty of houses hiding behind those pine trees (one of which peeps over the top - it must have amazing views! ), so you definitely wont have the beach to yourself in the height of summer. 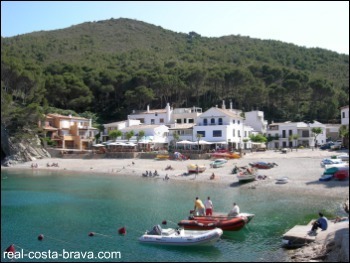 Between the small Port of Fornells and Fornells beach is tiny Cala Malaret. A good place to escape the crowds. 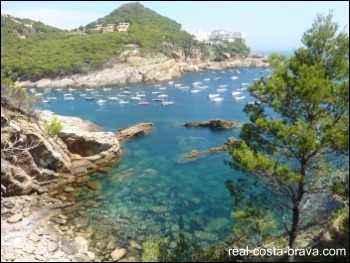 The small beach of Fornells and its surrounding coves (Estasia, Malaret, Ses Orats and Port Esclanya) apparently inspired this part of the Catalan coastline to be named the Costa Brava. As you can you see Fornells is right next door to Aiguablava. It is very easy even in the height of summer to have one of these little coves to yourself. 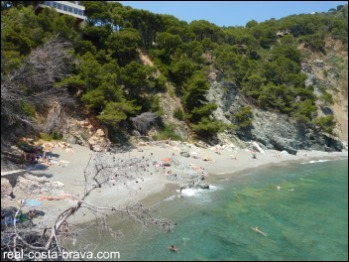 Aiguablava is a nice sized beach tucked into the pine clad headland. It makes for safe swimming as its waters are protected by d’Es Mut point which curves round to make a sort of natural harbour. The famous Parador Nacional de Turismo hotel sits on d’Es Mut point. Zoom in on Begur on the map below to see the numbers and names of the roads on the Begur headland. The nearest motorway is the AP7. 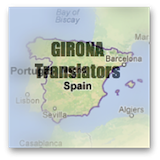 You can also get here by bus from Palafrugell, Girona and Barcelona. Please see for details. The nearest train station is Flaca (30km away).